Bastille have announced what promises to be a stunning Reorchestrated tour in April 2018. The tour will see the band performing in intimate venues and concert halls with a string and brass section, and choir showcasing reworkings of the highly acclaimed No. 1 albums “Wild World” and “Bad Blood”. 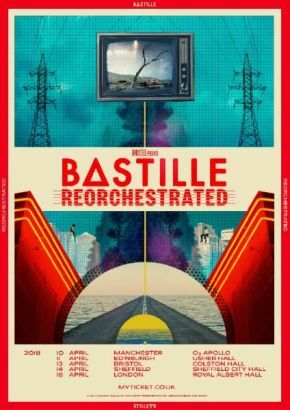 The tour was inspired by the intimate Union Chapel show in May of this year for the Streets of London charity where Bastille’s performance featured all new arrangements of their songs, a powerful departure from their “Wild World” arena shows. It’s been a busy month for the band with the release of ‘World Gone Mad’ taken from the Netflix film Bright starring Will Smith and collaborating with Craig David on his new single ‘I Know You’ which is currently sitting in the top five of the UK single charts.